Whew, spring was reluctant to come but now it feels like I’ve been thrown head first into summer! The end of the quarter wrapped up, graduation came and went and some where in between all of that cherries showed up at the market! I’ve been eating them by the bag full. Large, plump and so, so sweet. Screw chocolate! This winter shortly after Gourmet Magazine folded I was going through their website saving all the recipes I could, I also made a list of books from their Gourmet cookbook club selection to check out. I think the rest of Olympia had the same idea because I’ve been on the hold list at the library for quite a while. 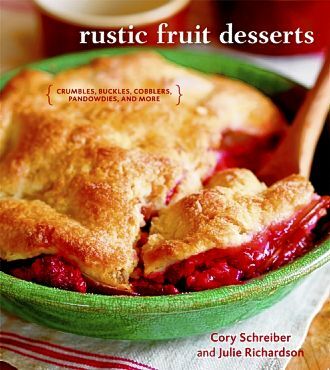 Cory Scheiber & Julie Richardson’s Rustic Fruit Desserts showed up just in time. Ever wondered what a betty, boy bait, grunt, slump or pandowdy were? This amazing little book has great descriptions of each of these down-home desserts and more! With seasonal recipes and photos so alluring I almost lick the page. I had a hard time deciding where to begin but with cherries on my mind and family arriving late at night I managed to save a couple handfuls of cherries for a brown betty. A betty features fruit that is layered between or on top of diced bread cubes-anything from basic white bread to brioche to challah to day-old baguette. In some parts of the county, a betty is made like a crisp, only with buttered bread crumbs (and no nuts or oats) as the streusel. This particular betty uses crumbled shortbread cookies in place of the bread, which helps to cut some of the tartness of the rhubarb. 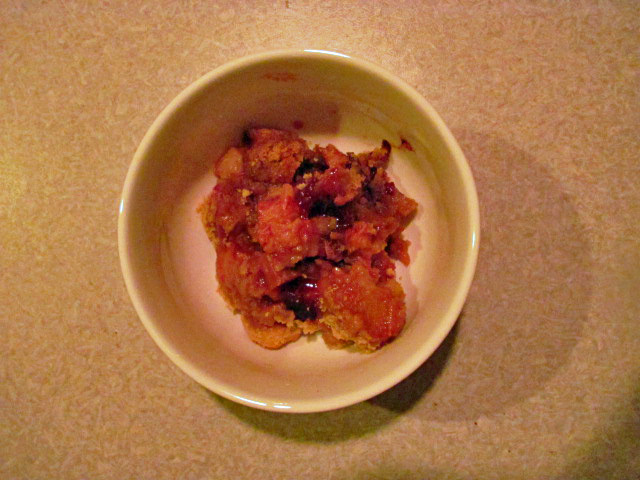 It’s cooked just enough for the rhubarb to soften but the fresh cherries still have a bit of firmness to them. The whole thing was gobbled down in less than 24 hours, granted we had a house full of family to help. Julie recommends using homemade shortbread cookies, though she says that Lorna Doone cookies could be used in a pinch, which is what I did. 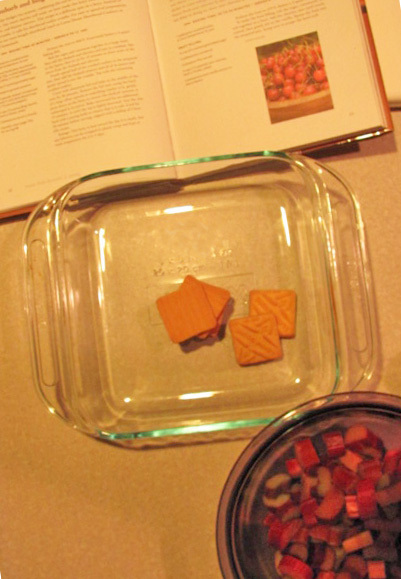 They worked well, though I would like to try it with homemade soon, but I expect any shortbread cookie would work. Preheat oven to 400ºF. Butter a 2 quart baking dish. Mix the cinnamon, nutmeg and sugar in a large bowl. Add the rhubarb and cherries, toss to cover the fruit and add the white wine. Allow to sit for about 15 minutes. Evenly spread half of the crushed shortbread in the pan. Pour the rhubarb and cherry mixture over top with all the juices. Evenly spread. Top with remaining cookie crumbs. Cover pan with aluminum foil and make in oven for 30 minutes. Remove the foil and using the back of a spatula press the betty down so make sure its submerged in the juices. Bake uncovered for another 15 minutes, until the topping is lightly brown. Allow to cool before serving. You can top with whipped cream or ice cream, but I think its best all on its own. This entry was posted in Cookbook, Dessert, Fruit. Bookmark the permalink. This was so yummy. I loved my tiny share of the last corner of the dish!